These rules are set in an alternative universe, where World War I is raging and is being fought by, amongst other things, lighter than air warships. 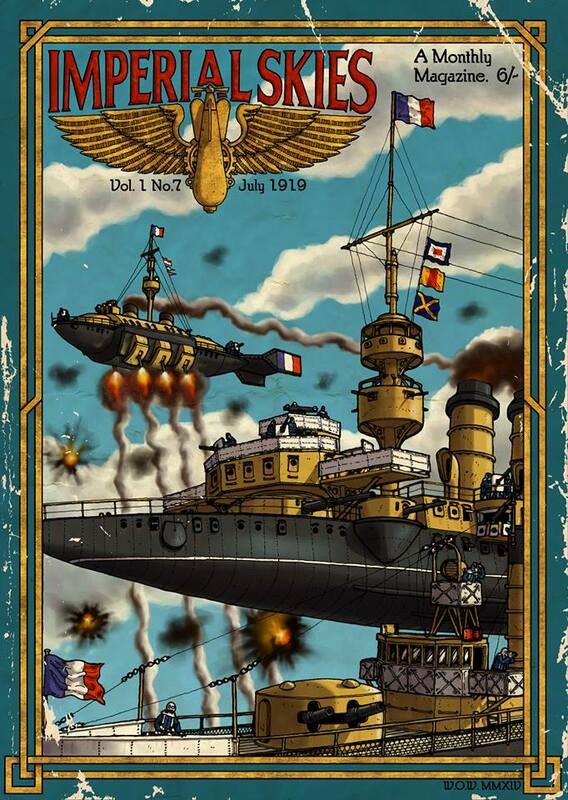 Imperial Skies is a table top wargame of lighter-than-air ship battles, played out over the land and sea of the early 20th Century. Fleets of flying ships are pitted against each other in fast-paced aerial tactical combat. Gather powerful fleets of your favourite nation including Battleships, Dreadnoughts, Cruisers, Destroyers, Aircraft, Bombers and Patrol Boats. Over the last two years we have been writing and testing a set of lighter than air ship combat rules. Now the rules are at that final stage of compiling, gathering artwork and proof reading and I need some help raising the fund for the printing. This kickstarter will help us get through final stages, producing a new full colour rule set and several new fleet ships. This project is being run as a partnership between Rottenlead the publishers of the Gruntz 15mm SCI-FI rules and Brigade Models, an established UK supplier of fine scale models for fantasy, sci-fi and historical gaming. There are already is an excellent range of miniature models available from Brigade Models in the UK and in addition to their existing range, if we hit some stretch goals with our Kickstarter we will be adding some additional ships and a starter fleet for a new Spanish fleet. Robin already has a proven track record in producing rues with the excellent Gruntz sci-fi rules. Whilst the genre Imperial Skies is set in is somewhat niche, these are well worth a look. The project is running until 22nd December, and at time of writing is a mere £92 from being funded. You can pledge for a rulebook or a rulebook and a single starter fleet set. Why not two fleet deals I wonder? Or extra starter fleet boxes as add-ons? These seem obvious additions but are currently strangely missing. Apparently, you can add additional sets. You just pledge the amount it would all cost and when they contact you after the closing date, they ask you to detail what you ordered. I pledged support for the rules and added the ruler pack and dice. I already have fleets. Oh cool. Thanks for that – just missed it in the write up. I was expecting additional fleets to be listed under ‘add ons’. I couldn’t see it either, so I clicked on the “ask me a question” button and got a reply. It’s a pity he didn’t put that bit of info in there, but then, like me, he may be new to Kickstarter. That or he’s taken it for granted that everyone would know.